WELCOME to my website where you will find highly specialized bookkeeping and office services. I understand that each business is unique with its own set of products, services, goals and requirements. I would gladly help you simplify your bookkeeping needs, easily and effectively. 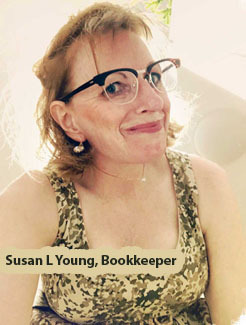 I have 30+ years of bookkeeping experience for a variety of business applications involving corporations, proprietorship's, small to medium sized businesses. Providing bookkeeping services for construction, trades, non-profit and various business. If you are required to file on-time monthly reports, financial statements, government remittances, payroll services and accurate bank reconciliations. I can help with a flexible schedule in your office or my office locally in the beautiful Comox Valley. My background and training have evolved over the years with manual general journal bookkeeping and progressed to the now sophisticated software based accounting packages of SAGE 50. Contact Susan to arrange a consultation and discuss your business needs.